Among the guiding principles was “a shift in emphasis from taxing income and investments to an emphasis in taxing consumption, where a wide range of personal choices can be made,” wrote the council chairman, A.D. Frazier. The goal was to lower the rate to 4 percent by 2014 and broaden the tax base. Among the council’s 2011 recommendations were that the state reduce and sunset numerous sale tax exemptions, including the exemption on groceries, and impose a sales tax on some casual sales and personal and house services. In 2019, as Americans approach another tax filing deadline, the stellar recommendations of 2011 are gathering dust. To be sure, Georgia did implement its first tax rate cuts in 2018, to offset the massive windfall to the state anticipated as a result of the Trump administration’s tax reforms. The top individual income tax rate dropped from 6 percent to 5.75 percent and the standard deduction was doubled. Corporate tax rates were also cut. The Legislature must vote in 2020 to further reduce rates to 5.5 percent through 2025. The state has further to go. 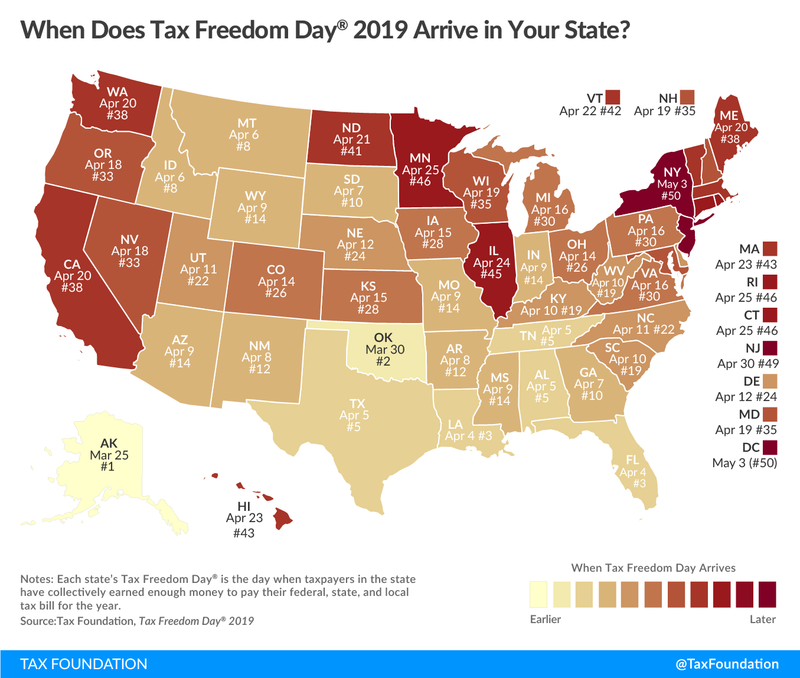 On April 10, the Tax Foundation announced its 2019 Tax Freedom Day, which represents how long Americans must to work to pay their tax burden. This year, for the nation, it arrives April 16. Among the states, Georgia ranks a respectable 10th in the nation: Tax Freedom Day arrived on April 7. But Georgia taxpayers still don’t free themselves of the tax burden as speedily as several no-tax and low-tax states in the South, including migration magnets Florida (No. 3) and Texas and Tennessee (tied at No. 5 with Alabama). North Carolina is close behind, at No. 11. Nationally, Georgia’s 5.75 percent top marginal rate is in the middle of the pack, at No. 25, according to the “Rich States, Poor States” 2018 Economic Competitive Index, published by the American Legislative Exchange Council. That trails Georgia’s competition, No. 1 (zero-tax) states Florida, Tennessee and Texas, as well as No. 22 North Carolina, which is at 5.5 percent. The issue is even closer than Georgia’s competing neighbors, however. The personal income tax rate deserves to be a crucial component of Gov. Brian Kemp’s fledgling Georgians First Commission, tasked with facilitating business across the state. An obvious goal of making Georgia “the top state for small business” is ensuring business owners have as much capital as possible to grow and succeed. As the National Federation of Independent Business notes, 75 percent of small businesses are unincorporated, pass-through entities: They report business income on their personal tax returns and are affected by higher personal income tax rates. These pass-throughs employ 54 percent of the private sector workforce. It makes sense, in an era of advancing technology and expanding service-based industries, to lower the rate by broadening the tax base. Instead of penalizing Georgians’ earnings, the state should target the consumption of goods and services. As the tax council recommended, reconsider and reduce exemptions aside from business and agricultural input exemptions. It makes sense, too, to make Georgia even more business-friendly by further reducing corporate tax rates to encourage investment across the board rather than focusing special-interest tax breaks on newcomers. Next year, as they vote on lowering tax rates, legislators should be motivated to take even bolder steps, in tandem with an education campaign that debunks scaremongers and misinformation. Georgians will embrace more money in their paychecks, along with the bonus incentive for government to become more efficient with taxpayers’ hard-earned dollars. © Georgia Public Policy Foundation (April 12, 2019). Permission to reprint in whole or in part is hereby granted, provided the author and her affiliations are cited. As a consumer I like to save as much money as possible on what I buy. In Atlanta, the sales tax is 8.9 percent and in Cobb County, 4 miles away from my home, the sales tax is 6 percent. Usually about twice a month I venture into Cobb County and buy a lot of items I use for the month. This saves me about $15 each trip. I keep telling residents in Cobb County if they increase their sales tax, they will lose more than the $10,000 per year I spend in the county and its sales tax. This means job losses. Sales taxes harm the poor more than the well off who can afford them without much penalty. Government needs to be frugal and collect less taxes from the prisoners forced to pay them.